Rich history, inspired culture, and abundant fresh ingredients all combine to make Vietnam a food paradise. The cuisine is a culmination of influences from China, France, India, Thailand, and Cambodia with its own indisputably distinct Vietnamese twist. 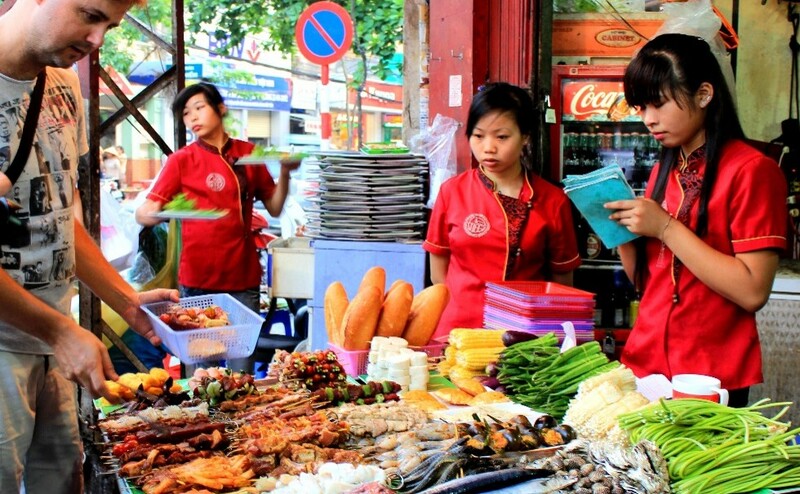 Without a doubt, food is at the heart of Vietnamese culture. Friends and family gather around meals for community and celebration and only the freshest ingredients are used. On VietnamIntro, you’ll taste the best street food in Vietnam, feast with the locals, and enjoy a traditional Vietnamese cooking class. Your trip starts in the northern capital city of Hanoi. Northern Vietnamese food is characterized by its strong French and Chinese influences, hearty flavors, and fresh, delicious seafood. Be sure to try Hanoi specialty Cha Cá Thong Long [Fish with dill]. Fish is brought in daily from the Song Hong river, marinated in a mix of earthy flavors, and fried over scorching oil right in front of you. The filet is then served over a rice noodle salad with peanuts, onions, dill, scallions, and of course plenty of legendary Vietnamese dipping sauce. Later on in your Vietnam adventure, you’ll stop at Ho Chi Minh City where you’ll be in for a completely new (but equally delicious) street food experience. Southern Vietnamese cuisine is sweet, colorful, flagrant, fresh with a mix of influences from Thailand, Cambodia, and India. 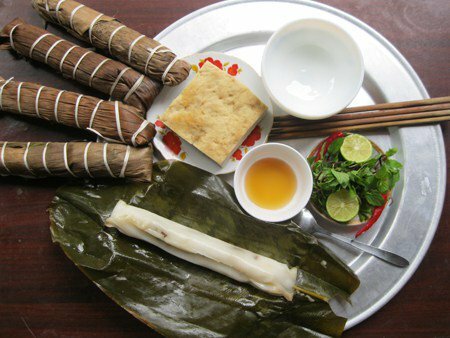 Bánh Tét [sticky rice cakes] is a favorite in the South. Rice from Vietnam’s famous Mekong Delta is mixed with fatty cuts of local pork, mung bean paste, and spicy black pepper, then wrapped and boiled in a banana leaf. It’s simple, packed with flavor, and indescribably delicious. 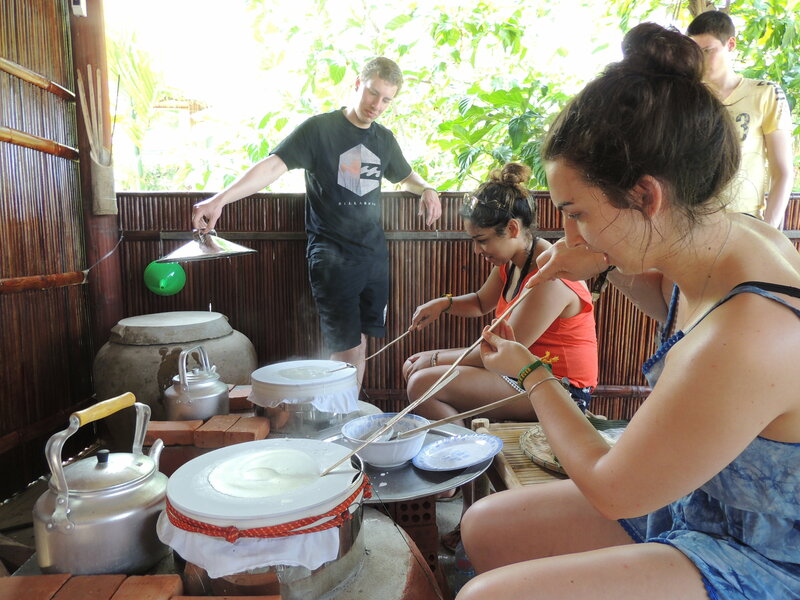 If you like to get hands on with your food, you’ll love VietnamIntro’s cooking class in Hoi An, the food capital of central Vietnam. 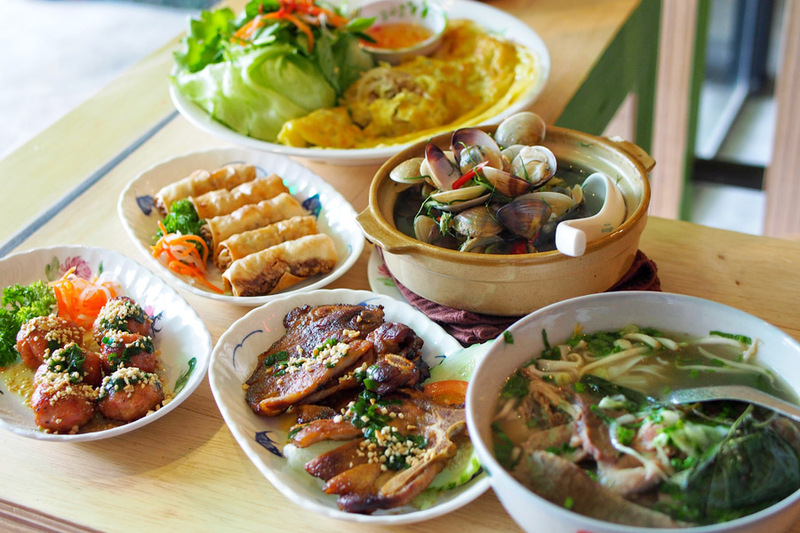 With your professional, Vietnamese instructor, you’ll learn century old recipes for making homemade rice noodles, fresh shrimp spring rolls with peanut dipping sauce, and pork and shrimp pancakes with chili garlic sauce. Oh and there will be plenty of food for eating too! There are so many things that make Vietnamese food delicious –fresh ingredients, exotic flavors, unique cooking styles – but there’s only one way to experience it – hop on a plane and taste it for yourself. Trust us, you’ll be glad you did. Check out Vietnam’s incredible beaches, caves, countryside, and other secrets you’ll explore on VietnamIntro!